Rushing through your body as you read this is about five quarts of blood. The stuff is vital to life. You don't think about it. You take it for granted. Pound360 does, too. But an article at the NY Times has renewed our fascination with the stuff. First, the piece explains that blood is a tissue. Makes sense, it's made of cells. The primary function of this fluid tissue, of course, is to carry oxygen and other nutrients to your cells (so they can operate), and haul away the trash (CO2, ammonia, and other nasties). 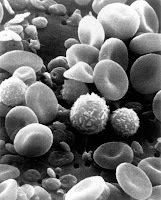 "Blood is the foundation of our very existence as multicellular animals." It serves as the "communications network", your body's internet, for directing organs towards a common cause (keeping you alive). Amazing. A clue to one of the greatest mysteries ever, where life came from, had been pulsing through our veins all along.